When I decided to run for city council, I made a pledge to not take money from, or sign loyalty applications with, any special interests, developers, businesses, or political action committees. While it’s a risky move, I know it’s the right one. Once in office, I want to have the freedom to work for you, not a small, powerful group who expects loyalty over critical-thinking and problem solving. If you check the financial filings on the San Jose City Clerk’s website, you’ll see that I held true to that promise, while our opponent has done the opposite. Now, they are coming after me. In the primary election, these special interest groups spent over $225,000 for our opponent. They are planning on spending another $400,000+ in the general election. They are truly frightened that we are going to win despite refusing to sign their loyalty application or accepting their money. Because of this, they are hoping that they can make up things about me and our campaign and that voters won’t see through it. Don’t let these shadowy special interests trick you! Below is an examination of their false claims sent out through mailers. In 2016, members of The League of Women Voters suggested that school districts explore contributing a portion of candidate filing fees (approximately $3,500 in the Campbell Union High School District) to eliminate the financial obstacle of running for office and to encourage a broader pool of candidates to run for office. This practice is common in some school districts in Santa Clara County and helps even the playing field. The School Board discussed the proposal, but ultimately decided to not move forward. Kalen had already been reelected (meaning any change would not have personally benefited him). In 2004 (14 years ago), Kalen was a college student serving as Student Body President at UC Davis (Go Ags!). The student body senate (of which Kalen was not a member) formally endorsed a former student who was running for local office. As Student Body President, Kalen signed the resolution. Students brought to the attention of the student government that this type of action was not allowed because of the student government’s 501c3 status. The student government immediately ceased such practices and passed an amendment to the student government constitution barring such activity in the future. “After learning of the prohibition from participating or intervening in a political campaign, your organization stopped passing resolutions in support of or against candidates for political office. You also intend to train newly elected officers and Senators on the prohibition from directly or indirectly participating or intervening in any political campaign. And you intend to amend your Constitution to include language that prohibits participating or intervening in any political campaign. In 2017 there was an accounting error at the Campbell Union High School District that lead to a small number of teachers getting overpaid in some paychecks. A district staff member corrected the error in a future paycheck. This was not a School Board action. To be fair: the district could have followed a better procedure and done a better job of communicating to the affected parties about what had happened. The quote in the attack mailer claiming to be from a member of our our teachers association is not from a teacher in our district. It’s a quote from one of our opponent’s biggest supporters. Update: The quote was so misleading, he demanded a retraction from the special interest group who manipulated it for their attack mailers. You can read the retraction here. The teachers union put out a statement about the claim, which you can read here. When Kalen launched our campaign in May of 2017, Kalen lived at a house on Flower Garden Lane, in District 9, where he had lived for a long time. In October of 2017, 5 months into his campaign for city council, Kalen decided to move to a new house about a mile away in search of more space and cheaper rent. This new house is also in District 9. 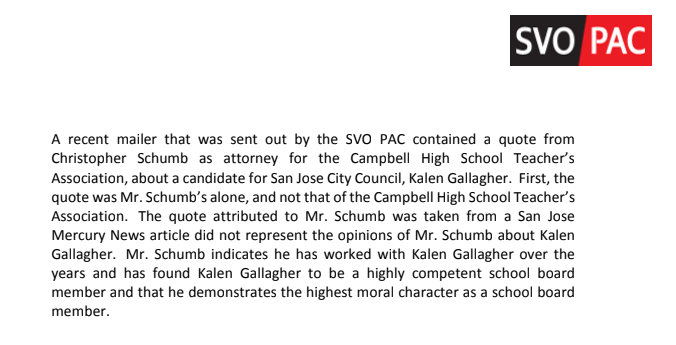 To say that Kalen moved into the area just to run for office is completely made up. Kalen has represented our community on the school board since 2012 and he’s a 4th generation resident of District 9.